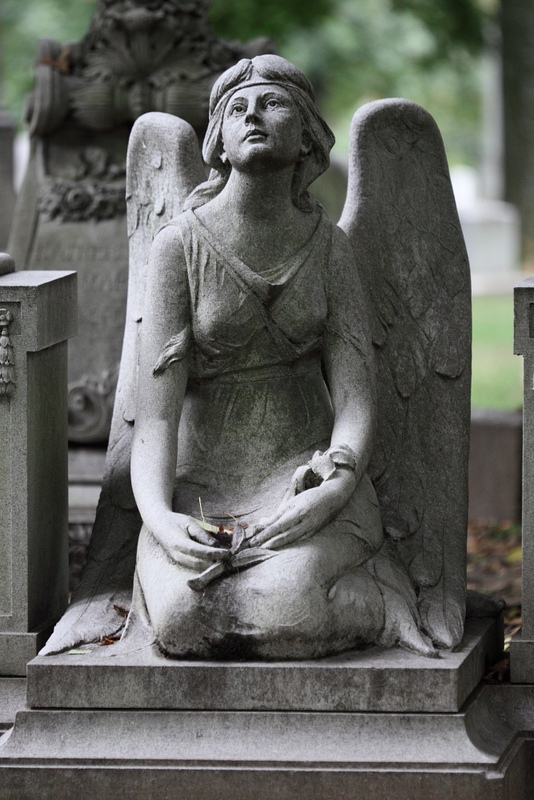 https://nolongertheonlyone.files.wordpress.com/2010/09/ee64a-ames20angel202.jpg [/img]A swift trip to Bellefontaine Cemetery this afternoon. It's a cool, cloudy and rainy day and I thought the gray diffuse light would make for interesting illumination of some of my favorite photographic subjects. So it did for the brief period before the water drops began to fall. So here I am, back at home, looking at the results and listening to a radio drama of Goethe's Faust. A curiously apt coincidence for all sorts of reasons. For not only is the play intimately connected with life and death and role of good and evil, it also happens to star the great Toby Jones as the Devil. It just so happens that Toby Jones also plays a similarly Mephistophelian role in an episode (Amy's Choice) of the current Doctor Who series that also happens to feature the Weeping Angels (The Time of Angels). I first noted Jones as the actor who gave a tour de force performance as the hapless Fruin in the final episode of the recent radio dramatization of 'The Secret Pilgrim' by John Le Carré. Now I seem to be hearing and seeing him everywhere. [/img]A gentle play of little consequence by the hand of chance. Nonetheless, I love these coincidences. 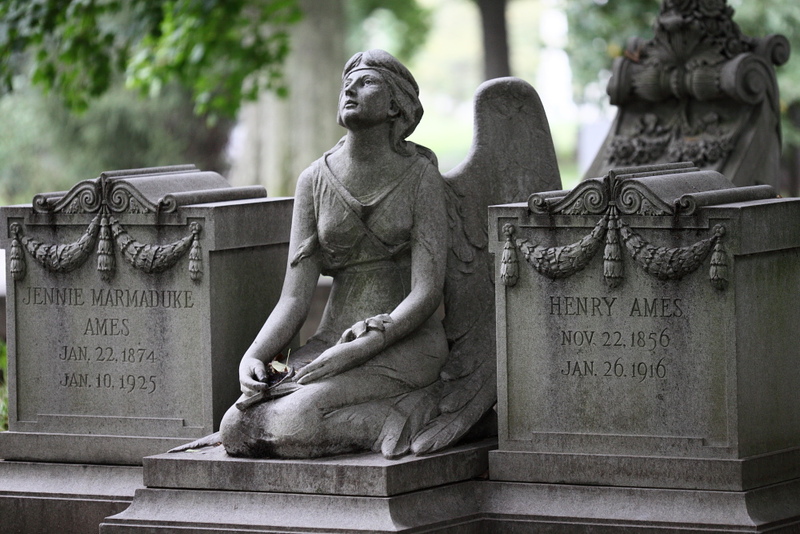 Back to the Bellefontaine angels. I've followed this green apparition, the Sidney Rowland Francis angel, over years and seasons and she remains unchanged and unchanging. She still clutches the broken stem of a palm leaf frond. Her face remains that startling combination of near luminescent green and charcoal black. However I did notice something new. 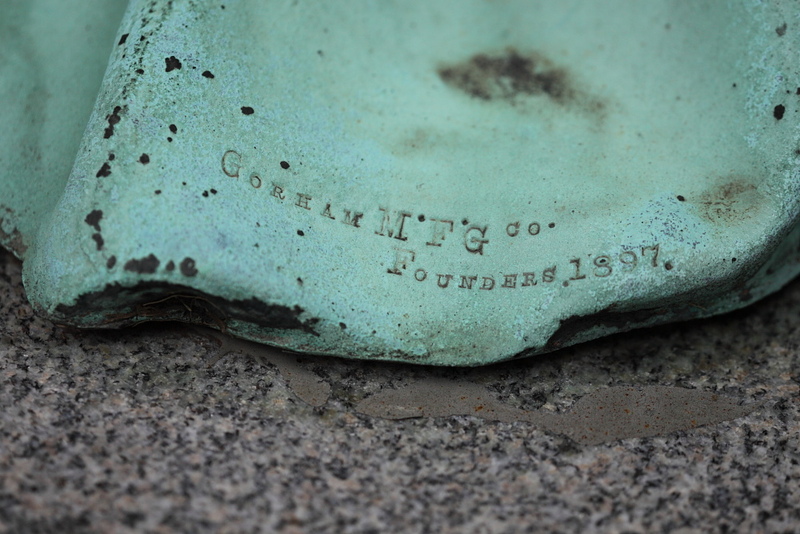 I was looking at the base of the statue and saw, for the first time, the maker's engraving. The Gorham Manufacturing Company, and dated 1897. 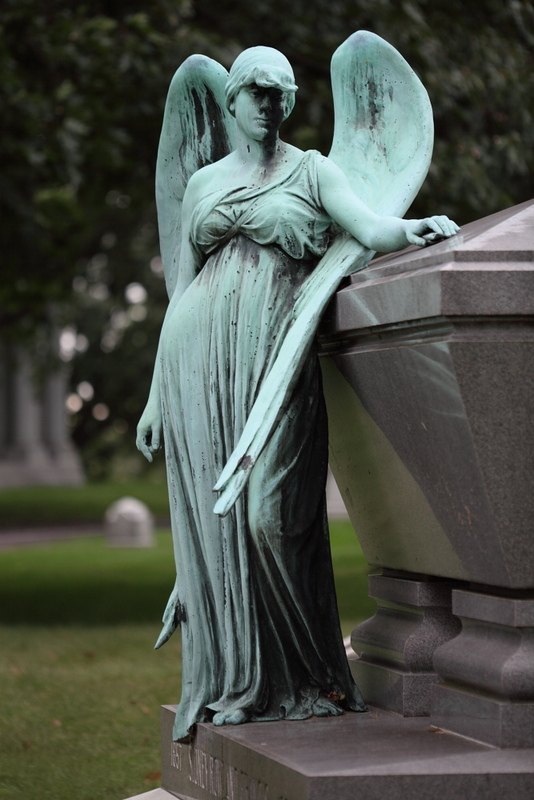 Entirely appropriate for a tomb that epitomizes the grandeur of Victorian era death. A grandeur available to the only the very wealthy, of course. 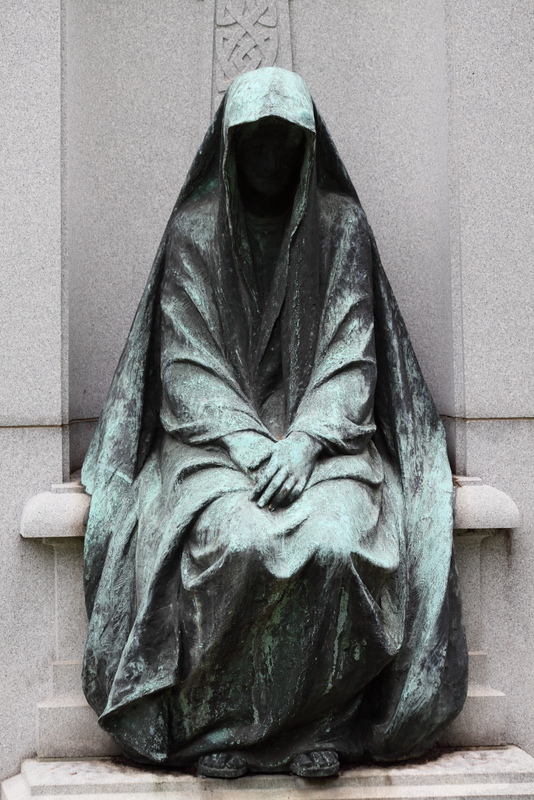 A visit to Bellefontaine would not be complete, too, without a glance at the very spooky figure that looks over the David R. Francis tomb and family plot. Today the dim light completely hid the face. Was there anything underneath? I think your interpretation of the last one is precisely what was intended, Star. Nonetheless, it still gives me the creeps – I think it's the hooded face that does it. Wow, what beautiful and eerie photos. That cemetery is amazing. I think the fact that the last one's face is completely in shadow is what makes it kinda creepy. The first angel is just lovely. Glad you like the photos, Jenny. 🙂 That first angel is lovely. I spotted it for the first time on Sunday. 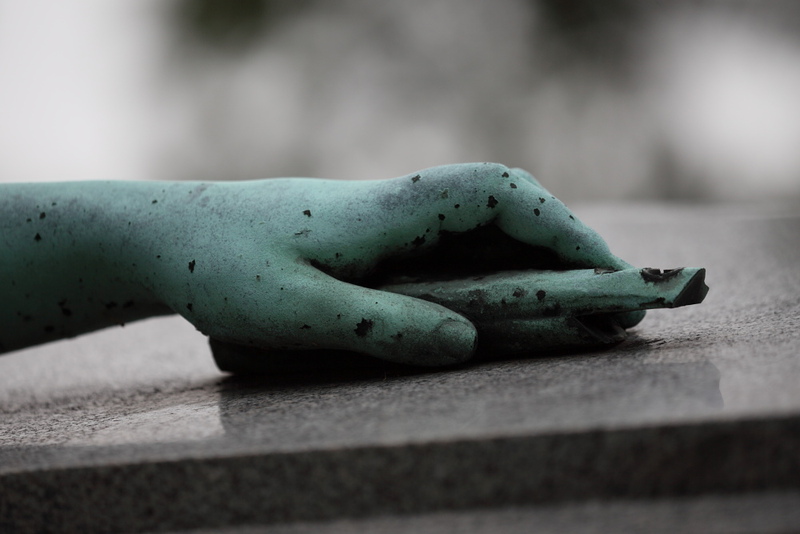 There's always new to find at these cemeteries.